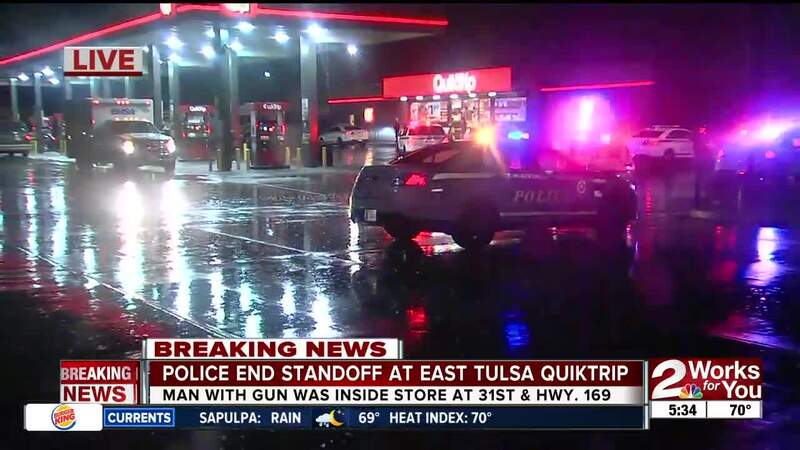 A man barricaded himself inside a QuikTrip restroom after police say he got violent with his wife. He has been arrested for domestic violence. 2 Works for You Reporter Gitzel Puente has the latest. A man barricaded himself inside a QuikTrip restroom after police say he got violent with his wife. The standoff lasted about 30 minutes and ended with the suspect, John Alexander, coming out voluntarily. Officers had to use pepperballs to get the suspect to come out. Police say he made threats about having a gun, but there was no weapon found. Investigators say it all stems from a domestic violence incident between the Alexander and his wife. They say the couple was fighting inside the store around 2:30 a.m. when the victim ran away from him. She had cuts and bruises but was able to get help. That's when police say the suspect barricaded himself and was uncooperative with officers, until they put a stop to it. Alexander was arrested and taken to the Tulsa County Jail. He was booked for domestic violence.